Challah is a special Jewish bread eaten on ceremonial occasions such as Sabbath and other Jewish holidays. It is a delicious braided bread covered with poppy or sesame seeds. 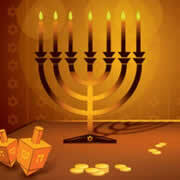 Hanukkah is a fun, exciting, family-oriented, Jewish holiday celebrated in December. There are many traditions associated with this holiday. One of them is playing dreidel which is a special top spinning game. Hanukkah holiday honors the struggle of the Jewish people to restore the Temple of Jerusalem. How to make a Driedel and play the Driedel Game! Here's a word search dedicated to Hanukkah! I have been using your site constantly over the last few weeks as I was allocated a client with young on-set dementia. Your strategies, games and ideas have been brilliant. Thanks again!